A bottle here, a can there. Litter is an eyesore in any country. But for Haitians, especially in Port-au-Prince, the problem of trash goes well beyond aesthetics. It’s life or death. Empty plastic bottles, aluminum cans, and other rubbish create a major health hazard when they pile up and block drainage canals. The rainwater overflows and sweeps down densely populated streets, carrying human waste from open latrines in its wake. (Many Haitians live in simple makeshift shelters with no indoor plumbing.) As puddles form along the crude streets, children splash in what may be a perfect petri dish of disease-causing bacteria, such as cholera. GiveThe good news is that the situation has started changing for the better in Port-au-Prince and several other areas of Haiti thanks to a creative project called Ramase Lajan, which means “picking up money” in Creole. 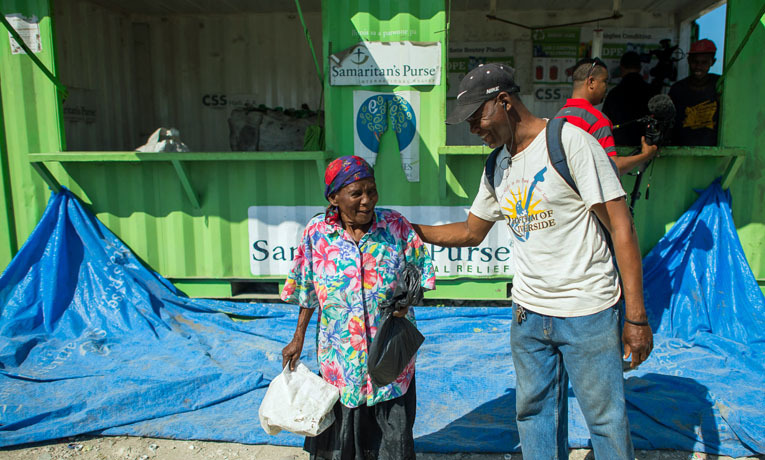 Samaritan’s Purse has partnered with Executives Without Borders, CSS International Holdings, and Haiti Recycling to support the program. The beauty of the project is that it addresses many of the country’s issues in a simple and sustainable way. By setting up locally-run recycling centers in different communities and paying anyone who turns in cans and bottles, trash gets picked up, the risk of disease is reduced, and people are able to earn desperately needed income. Each center is run by a Haitian franchise owner selected through an application and interview process coordinated by local churches. Franchisees receive a $2,000 loan in three installments to cover start-up capital and to defray the cost of the large shipping container that serves as their recycling center building. Generally, each center hires three to five employees to weigh, sort, clean, and stuff plastic bottles in bags in preparation for transport to Haiti Recycling. Franchisees make a profit of 1.5 gourdes per pound, plus they receive an additional 15 percent on the entire amount from Haiti Recycling. Franchise owners pay peddlers 4 Haitian gourdes (about 10 cents) per pound. The recycling centers are conveniently located within neighborhoods; for a peddler to travel to Haiti Recycling’s only location would generally require too many resources to justify the trip. “People consider the recycling center as a bank. It’s where they come to get money,” said Adam Wilchide, the Samaritan’s Purse recycling program manager. When one franchise had to stop accepting recyclables for a short time, the circumstance created “a plastic jam,” Wilchide said. People actually began visiting the owner’s home asking him to buy their trash. Some of the results of Ramase Lajan are obvious. There’s less trash lying around compared to last year when the program started—at least in areas near one of the 13 recycling centers or franchises. More than 1.3 million pounds of recyclables have been collected since December 2011. An average total of 2,700 pounds of plastic is collected each day at the centers. “Now we can see a difference in the streets and canals,” Wilchide said. People need a clean community, said Oxame Guirlene, mother of five children and a regular employee at one of the recycling centers in Port-au-Prince. Since 2011, more than 95,000 Haitians have been educated on hygiene and recycling concepts, including church and school groups. Civic pride, basic hygiene, and environmental stewardship are critical lessons many Haitians are learning for the first time through Ramase Lajan. Not only does the program help the environment, it improves the very livelihood of thousands of people. Most Haitians are mired in poverty. There is no universal public education, literacy levels are low, and the unemployment rate is high (an estimated 40 percent in 2010). Many residents of Cite Soleil, a notoriously dangerous and impoverished section of Port-au-Prince, often eat just once a day, if that. The area’s General Clinic, supported by Samaritan’s Purse, treats an average of 53 patients with acute malnutrition per month. So, even a little income can change lives. The recycling program is not a handout—money paid is money earned. There’s great dignity in that and hope for the future. Nor is the program a luxury. It means a great deal to everyone in the process. “If I come and bring plastic, I get food for my kids,” said Therese Louis, a regular peddler who received 55 gourdes (around $1.40 US) for 14 pounds of trash on the day she was interviewed. Since the Samaritan’s Purse project started more than $135,000 has been generated for participating communities. “It’s like an answered prayer,” said Manique Laguerre, who operates one of six centers located in Cite Soleil. He said he previously had trouble paying his children’s education fees but now he can send them to school and meet other daily needs. In speaking with Laguerre, another important aspect of the Samaritan’s Purse recycling program becomes clear. In the owner selection process, we look for committed followers of Christ who also possess necessary business skills. With the right people in place, the recycling centers become beacons of light in difficult places, bringing spiritual hope as well as economic and environmental benefit. Laguerre is a leader in his community and his church. He works hard as a franchise owner, not afraid to pick up a stray bottle on the ground or do anything else that might be needed. At first Laguerre was actually working so hard that he was losing too much weight, program manager Wilchide said. In everything, Laguerre strives to be a Christian witness. When he hires employees, he is looking to hire those who most need the income, those who find themselves most vulnerable. He currently has five regular employees and four occasional employees. He also knows his peddlers well—an average of 50 per day who visit his site—and prays for them. They are always paid honestly. Everyone involved can see the scales, so there’s no cheating. If they are sick, he tries to find them the medical help they need. “You preach the Gospel by words and actions,” Laguerre said. As a local, he intimately understands the surrounding culture and mindset. The Haitians are by nature a religious people, Laguerre stated. True conversion to Christ is not about religious rituals. “We don’t want people just to go to church; we want them to adore Christ,” he said. The foundation verse for the Samaritan’s Purse recycling team is 2 Corinthians 5:17: “Therefore, if anyone is in Christ, he is a new creation; old things have passed away; behold, all things have become new” (NKJV). Through environmental stewardship training, income for the jobless, and daily witness, Ramase Lajan has truly become an effective and holistic way to communicate this message to people young and old in Haiti. “Everything we do is to show the love of God,” Wilchide said.